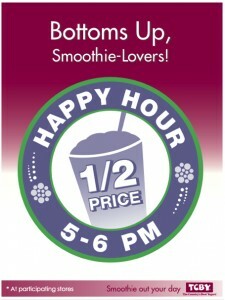 TCBY is now offering Smoothies 1/2 priced during Happy Hour every week night from 5-6 pm at participating locations. Their smoothies are made with real dairy yogurt and fruit. Yummmmy! Wish we had one close to us! On Wednesday, join them for 99¢ Waffle Cone Wednesday. Find a participating store near you.